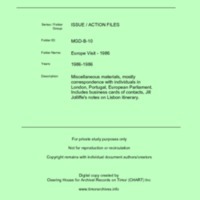 Miscellaneous materials, mostly correspondence with individuals in London, Portugal, European Parliament. Includes business cards of contacts, Jill Jolliffe's notes on Lisbon itinerary. “Europe Visit - 1986 [MGD B10],” CHART DIGITAL, accessed April 18, 2019, http://chart-digital.info/items/show/637.